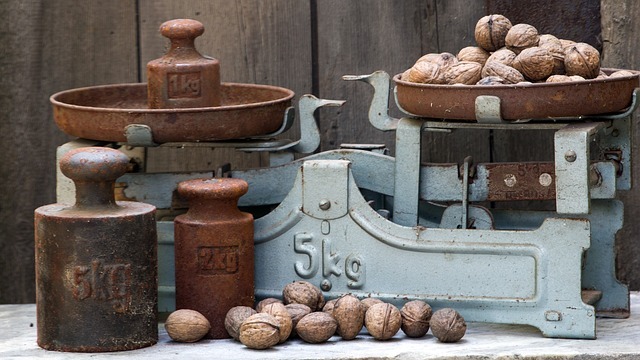 Over the last couple of weeks, I have had an internal debate on my approach to tracking dividends–and we have discussed it in some of the comments. Initially, when I started this blog and created a focused dividend portfolio, I only referenced the dividends generated from my new purchases–as well as a couple of long-standing holdings in Apple, Abbott, and AbbVie. Over time, I introduced the dividends from my core retirement accounts that are invested in index funds into my dividend income report. I had also included the self-made REIT ETF that I created with the funds from my pension rollover. Ultimately, I decided to include all sources of dividends as part of my report. However, as I have been giving a lot of thought recently to my early retirement draw-down strategy, I have come to a realization. While I don’t anticipate that this will change my approach to tracking at this time, it is something that I need to recognize. That realization is that not all dividends are created equal. When I say that not all dividends are created equal, what I mean is that as one strives towards the goal of early retirement, the ability to leverage those dividends to cover all, or a portion of, your living expenses is dependent on your age and the type of account where those dividends are generated. My personal FIRE (Financially Independent Retired Early) goal is to step away from my current career at the age of 52. During my younger years, I focused on maximizing my tax-advantaged accounts such as my employer’s 401(k) account and a Traditional IRA for myself and DivvyMom. As the years progressed, our ability to contribute to a Traditional IRA and then a Roth IRA disappeared due to the modified adjusted gross income (MAGI) limits. Obviously that is not such a terrible problem, however there was one glaring hole in our strategy. We did not funnel additional savings into a taxable brokerage account. Unfortunately I have not met anyone that has a time machine, and therefore my reluctance / fear / ignorance (take your pick) of investing in a brokerage account due to the tax implications resulted in a lost opportunity. It wasn’t until 2011 that brokers had a responsibility to begin tracking your cost-basis on shares purchased and dividends that were reinvested. Therefore, rather than buckle down and ensure that I was maintaining detailed records, I foolishly ignored making investments in my brokerage account. Why is that important in relation to FIRE? Well, as you may know, your ability to access tax-advantaged funds before the age 59.5 is limited. There are strategies to mitigate that, and I won’t go into a lot of detail here but will try to summarize them, including some of the challenges. Roth Conversion Ladder :: The concept is to transition funds in a 401(k) to a Traditional IRA, or simply start with your Traditional IRA, and then convert them over to your Roth IRA. It is most advantageous to do this after you’ve stopped working as that minimizes the tax impact as you can convert up to $24,000 under the standard deduction for married couples filing jointly. The converted funds cannot be accessed for 5 years, and that is part of the problem. If you start this process once you’ve stopped working to reduce the tax impact, you will need an alternate source of funds–typically a brokerage account or cash–to cover the gap until you can begin withdrawing those funds. All of this assumes you’ve retired before the age of 59.5 as well. Substantially Equal Periodic Payment (SEPP) :: This option allows you to withdraw funds from an IRA or 401(k) prior to the age of 59.5 without incurring the early withdrawal penalties. While this can address the issue of having a gap between your early retirement date and the age of 59.5, there is one drawback in my opinion. First, you must withdraw the same amount every year and those funds are placed into an SEPP plan that pays you an annual distribution.That annual distribution is required for five years or until you turn 59.5, whichever comes later. With my goal to retire at 52, that means that I would need to withdraw funds for 7-8 years, which is longer than I would need based on current taxable investments and cash available to cover our expenses. Rule of 55 :: The IRS Rule of 55 allows an you to withdraw money from your employer 401(k) plan between the ages of 55 and 59.5 without penalty as long as it is only from the 401(k) where you were employed up to or after you turn 55. This sounds like an attractive option, however there is one issue based on my scenario. As I plan to leave the workforce at the age of 52, I will have left my employer before the age of 55 and therefore would be unable to take advantage of this option. Therefore I would need to either adjust my plan and continue working until the age of 55, or find a job in semi-retirement that provides a 401(k) and rollover my primary 401(k) into that new account (and still continue working until the age of 55). Withdraw and Take 10% Penalty :: As I have been investigating my draw-down strategy, I have read a few articles that propose the fact that it may not be as negative as one thinks to take early withdrawals from your tax-advantaged accounts and simply pay the 10% penalty for doing so. Off the cuff, this would be the least attractive option to me as I don’t like the idea of being penalized with a tax for utilizing the funds that I’ve saved for my retirement. Alright, let’s pull this back to the discussion about dividends and how they are not all created equal. When I initiated my dividend portfolio, my thought process was to utilize the dividends once we reach the age of retirement to supplement our income and allow us to take a more conservative approach to our safe withdrawal rate. Being late to the game–at least in terms of dividends from a taxable account, because as mentioned above, all of the dividends in my tax-advantaged accounts are not readily available until age 59.5–let’s see what that would look like as of today. You may recall from my more recent dividend income reports that I have included the dividends received from tax-advantaged accounts in addition to those from my taxable account. Unfortunately that presents a more optimistic view of the dividends that will be available to me than what is my current reality for the early years of retirement, unless of course I leverage one of the options above. As you can see here, the portion of my total investment portfolio that pay dividends currently generates $15,625 annually. With approximately 10 years left to go until my targeted retirement date, that would provide a number of years for me to continue growing that amount. Based on current projections, assuming that I made no additional contributions and using the overall growth rate of all dividends, that would be approximately $23,000 to $25,000 in annual dividends in 10 years. Given that I will be continuing to invest new capital, that amount should actually turn out to be considerably higher. However, there is one big problem. Not all of those dividends are accessible to me in the early years of retirement. Without utilizing one of the options previously discussed, I would be limited to accessing the dividends only from my taxable account. That means even the dividends from my REIT ETF, which are in a Rollover IRA, are off-limits. My taxable brokerage account currently produces only $3,317 in annual dividends. That is quite a different picture than thinking that I have over $15,000 in annual dividends readily accessible to help cover our expenses in retirement, or at least the early years of retirement. This all might be old hat for you, but as I’ve been digging into draw-down strategies and beginning to formulate my own plan, it has been a bit of a “light-bulb” moment for me. I’ve been so laser focused on simply accumulating enough assets that will provide for a comfortable and early retirement, I haven’t been paying as much attention to how we will access those funds to actually cover our expenses until we reach the age of 59.5. As my friend’s over at Dividend Diplomats regularly remind their readers, over the next 10 years I really need to focus on making every dollar count. To bridge the gap between our early retirement age and when we can begin drawing from our tax-advantaged accounts, I want to continue focusing on being as aggressive as possible to fund my taxable account and continue feeding this dividend machine. The above forecast from Simply Safe Dividends uses the current numbers from my taxable portfolio. 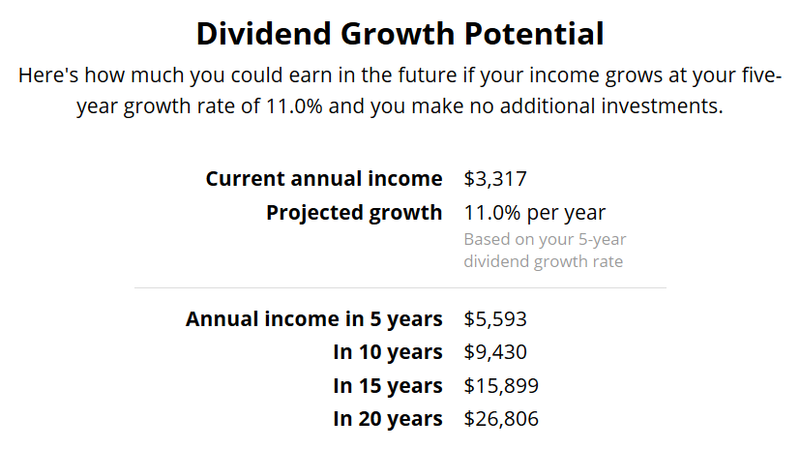 Assuming that there are no further contributions and my average 5-year dividend growth rate remained stable, I would be projected to have $9,430 in annual dividends from my taxable account in 10 years. While that might be great, that isn’t going to go very far in early retirement. However, as I mentioned, I definitely will not be sitting idle and will continue to deploy new capital as often as possible. My initial goal has been to create $20,000 in annual dividends, which if I include all investment sources is a slam dunk. However, I am revising that goal to create this amount purely from my taxable account. Let’s run some back-of-the-envelope math to see what I think should be realistic. Taking a look at the last few months of progress, on average I have increased my projected annual dividend income by $191.10 each month. On an annual basis that would be $2,293.16, and with approximately 10 years until my targeted retirement I would be looking at roughly $22,931.60 in annual dividends. Add to that the $3,317 that I am earning today, and I would have $26,248.60 in annual dividend income at the age of 52. However, as I would anticipate having $40,000+ in annual dividend income from all investment sources, you can see just how important it can be as to the source of those dividends and how those can be utilized in early retirement. Hopefully this hasn’t been too scattered and you now (or already did) understand what I meant when I said that not all dividends are created equal, at least as they pertain to being an income source in the early years of retirement. I have only scratched the surface of researching and educating myself on an appropriate draw-down strategy for once we retire. However, I am extremely grateful that I have started down this path now as it has opened my eyes to the importance of looking beyond the accumulation phase that I am so engrossed in right now. Hindsight is 20/20 and all of the shoulda / coulda / woulda’s cannot change the mistakes that I have made in the past–and believe me, I have made my fair share. However none of that will change the fact that I will continue working as hard as possible to fund my dividend portfolio and grow a substantial dividend snowball that we can play with in early retirement. As I close this out, I will note that for the time being I am not planning to change the tracking in my spreadsheet but will definitely continue to separate out the sources of dividend income in my monthly reports. This may change as I move forward, but I have setup my portfolio in Simply Safe Dividends to track by source for now. If you’re still with me, thank you for reading! I would love to hear your feedback, as well as your thoughts surrounding your draw-down strategy if you’re planning to retire early. I think you are definitely on the right track now with building more of your dividend income from taxable brokerage accounts. For years, I was actually the opposite of what you were doing. I had built most of our dividend income in taxable accounts but didn’t take full advantage of tax advantage accounts to keep our taxes lower. I certainly think it is good to have a mix of both types of investments. Thanks for stopping by and sharing your feedback John! Definitely agree with you that it is good to have a mix of both types, I’d ideally like to get more into a Roth with the intent to leave that for my boys and their families. Between both types of accounts, it looks like we share about 15 companies or so. Hopefully they all continue to grow and add to both our taxable and tax-advantaged accounts for many years to come! Thanks for sharing Tom. In hindsight, I definitely wish that I had taken that path at an earlier age as well. Unfortunately I allowed that fear, or I would really say it was more an ignorance of properly educating myself on the process, of having a tax hit dissuade me from being aggressive with a taxable account. That is my current focus as it will be necessary to provide for us in those first few years if I remain true to my target of retiring at 52. Very happy to hear that it has worked out well for you! I totally get it and fricken love it. I think you can do the conversion, if you’re brave enough, haha. BUT – I also know that you are going to be bringing in more money, saving more money than ever before, SO THAT YOU CAN FUEL THAT DIVIDEND TAXABLE ACCOUNT BABY!!!! You got this. You’re fricken Divvy Dad and are making waves here. I’m excited for you and glad I get to experience your journey. Just awesome. Thanks Lanny, I appreciate the support and encouragement that both you and Bert provide–not only to myself but to the DGI community as a whole! I do anticipate that we will end up doing the Roth conversion, but I believe it will have more of a focus to reduce the impact of RMDs as we get older than to be a source of income for our early years of retirement. I will not stop pouring fuel on this FIRE! Things in Canada are a little different for us with the tfsa. Can withdraw at any point tax free. I know on choosefi they talk about drawdowns all the time and some guys can get to a break even tax rate. You have been killing it lately with your capital so im sure you would be fine by your target date. You could also refinance your mortgage at retirement to hold ya off til 59. Thanks PCI, and I do love, and am envious of, that TFSA account in Canada! I’ll have to check out the ChooseFI series, I’ve never been a huge fan of podcasts (assuming you are talking about their podcast) but I am consuming as much as I can right now on draw down strategies to begin formulating our plan. That is an interesting note about using the mortgage as I had not considered that. Our current plan is to relocate out of the state we live in now once our boys are done with college and fully on their own. When doing so, our plan right now would be to buy something where we would most likely have no mortgage (downsizing from our current home and to a lower COL area) so there should be plenty of equity that we could tap if needed. Hopefully we can continue to ratchet up the capital we are investing though so that wouldn’t even need to be a consideration. Appreciate the additional suggestion as it gives another path to consider. Excellent post DivvyDad, and I’m glad the lightbulb finally came on for you. As for me, I keep things simple. The reports that I publish are only based on my taxable account. I simply ignore the dividends I receive in my retirement accounts. I almost treat my retirement accounts as if they don’t exist. I set it and forget it! But, I’m under no illusions. I don’t have that many more years to go until retirement. Based on the amount I’m contributing to my portfolio every year, I’m fairly certain that I won’t be able to rely completely on the dividend income from my taxable account. Rather, that income will supplement my savings. But, figuring out how to draw down your investments when you retire is something that should be handled now, rather than later. As I mentioned, excellent post. Thanks DP, appreciate the comment and glad you liked the post. Like you noted, even if we cannot completely cover our expenses with dividends from the taxable account, I believe having a nice chunk come from that will aid our overall portfolios as it means less that would need to be sold off. The longer you can leave that untouched, the more safety you build into the sustainability for the long-term. Great post DivvyDad! It was nice to find out more about how the system works in the US. I think it’s a really good decision to treat your dividend income from dividend sources differently due to limitations of when you could start living off them. It’s quite different in my country (Lithuania). Additional contributions to pensions became available only recently (I think it was 2007 when you could start contributing 2% of your salary additionally). Since the average pension in Lithuania currently stands at ~€330 and most of the people currently in retirement haven’t saved much (investment and additional contributions are still not common), it’s pretty hard for our elderly to live comfortably. The situation should start looking better as people are encouraged to save for pensions additionally but it’s still not a lot and I don’t think those contributions will be enough to have the same quality of life in retirement. That’s why I am saving and investing part of my income in a taxable account, to be able to still live comfortably when I don’t work anymore. I am also blessed to have an employer matching my additional contributions to pension (I think it’s similar to 401k) where I contribute 1% of my salary and employer matches it with additional 1%. Starting from January I will be able to up it to 2% + 2%. Thanks BI, and I appreciate you sharing a little about how things are in your country. I find it helpful to have that perspective of how things work in different countries and some of the nuances that my fellow investors have to deal with. The pension does sound similar to the 401(k), and at one time pension plans were quite common here in the US as well. One of my earlier employers offered a pension plan, and I actually opted to receive my disbursement earlier this year after leaving the company previously and my pension now being vested. They aren’t as common here these days and most employers only offer the 401(k) now. I think you’re doing the right thing by taking control and doing what you can to provide as comfortable a retirement as possible! Great post, DivvyDad! Although the distinction between taxable account dividends and retirement account dividends is a topic I’ve thought about from time to time, it’s absolutely deserving of more consideration than I’ve given it to this point. At this point, my portfolio is roughly 80% taxable and 20% retirement. I expect that over the next few years upon graduation next summer, my retirement allocation will be overtaking my taxable allocation as I’ll be maxing my Simple IRA at work and an IRA to maximize tax savings. As my earnings increase over the next few years, I imagine I will have more funds to allocate outside of my retirement accounts. If I get to a few years before my intended retirement age and I am significantly short of my taxable portfolio target, I should be able to aggressively save and invest in my taxable accounts. Thanks Kody! It is definitely a topic that is not written about quite as much, nor do we tend to give it much attention because it can be such a challenge to just accumulate enough in our working years. However, I agree it is deserving of more consideration as there are implications in our later years (whether that be things like I’ve discussed here, or receiving massive RMDs that impact your taxes, etc.). I’m kind of where you mention at the end, I am about 9-10 years from my target and now doing my best to aggressively save in my taxable accounts. This post highlights a simple yet overlooked fact about dividend income… depending on the account it sits in you may not be able to touch it for long, long time. This is why my taxable account is by far much, much larger than my ROTH or IRA despite the tax advantages they offer. I’d like to able to access my dividends (cash) any time I want. Nice write up. Thanks Keith, appreciate the feedback. It is definitely something that I didn’t think about in my younger years, but as I begin to get closer to that target retirement date it is becoming more relevant. That’s great that you have had that focus on your taxable account, as having easy access to those dividends at any time gives you the flexibility! I was a little late with regard to focusing on a taxable account as well, but did see value in being able to have access to a good portion of money now and in the future, so I started down that path more aggressively a few years ago. The additional tax that comes with a big taxable account is not ideal, but having the flexibility to access the money will certainly be needed if early retirement is in the cards. If I recall correctly, the last time I checked, I was around 35%/65% for my taxable to pre-tax ratio. I’d like to keep pushing that closer to a 50%/50% mix, but I haven’t skewed my contributions to support that. My 401k offers Traditional and Roth options, and I direct money to both, but not as much to the Roth as I’d like, as giving up the current tax deduction is no fun. Appreciate the feedback ED. I’m currently at a 23% / 77% split between taxable (and cash) and tax-advantaged accounts but working diligently to balance that out.